A Shrove Tuesday competition began February 21, 1950, between people in Liberal, Kansas, and Olney, Buckinghamshire, England, creating International Pancake Day. Each year the communities hold a 415-yard race to determine the fastest runner who can also flip a pancake. Typically the fastest runner completes the course in just under one minute. Commemorated elsewhere as Mardi Gras, Pancake Day, Fat Tuesday, and Carnival, Shrove Tuesday is the day before Ash Wednesday, the first day of Lent, a 40-day fasting period in preparation for Easter. The verb shrove is Old English and relates to judgment or penance in preparation of Lent. Observers of Lent traditionally quit eating richer foods with ingredients such as eggs, milk, and sugar. These ingredients were often used up in recipes before the feasting period began. The Olney tradition dates to around 1445. Legend holds that a woman in Olney was making pancakes when the church bells began ringing to announce the service. Carrying her frying pan and wearing an apron, she raced to arrive at church on time. In subsequent years, others in the community joined in the race. The prize was the "Kiss of Peace" from the verger, or bell ringer. The Liberal/Olney competition began when members of the Liberal Junior Chamber of Commerce learned about the Olney race and proposed a friendly competition with the English community. 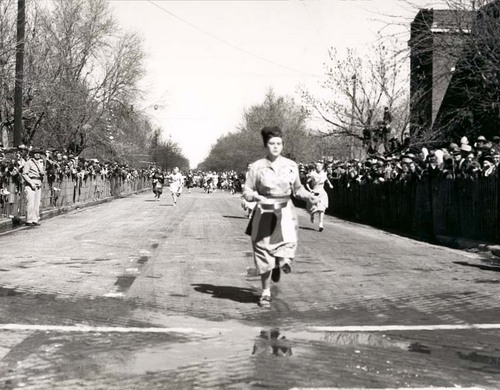 The contest, which continues today, requires that runners wear a traditional apron and scarf and carry a frying pan in which they toss a pancake at the beginning and ending of the race. The event concludes with presentation of awards and a church service.